Marlin is the common name for several, large marine billfish in the family Istiophoridae of the bony fish order Perciformes. As with the other members of the family, known as sailfishes and spearfishes, the marlins are characterized by a rounded bill, elongate pelvic fins, a dorsal fin with a very long base, depressible into groove, and adults with scales and with teeth. Traditionally, those fish known as marlins have been placed into two genera, the blue and black marlins comprising the genus Makaira and the white and striped marlins in the genus Tetraputurs (with the spearfishes). However, different taxonomic schemes are recognized, with a recent classification placing the black marlin (M. indica) in its own genus Istiompax (as Istiompax indica), and the white and striped martins moved to their own genus, Kajikia. In addition, the blue marlin is variously recognized as one species (Makaira nigricans) or divided into two species (Indo-Pacific blue marlin, M. mazara, and Atlantic blue marlin, M. nigricans). Marlins serve important functions in the ecosystem and for humans. Ecologically, they play an important role in marine food chains as apex predators, primarily feed on cephalopods (squids, octopuses) and fish, including the fast tuna, which they can catch and stun by slashing their long bill back and forth. For humans, marlins are a rare culinary delicacy, appearing mostly in fine dining restaurants. Blue marlin meat is of good quality because it has a high fat content. Its meat is particularly valuable in Japan, where it is used raw for sashimi. Marlins often are caught as bycatch in tuna longline fisheries. These large fish are a particularly popular sporting fish in certain tropical areas, highly sought by recreational fishermen on rod and reel as a prestigious catch for its rarity, size, and excitement, including jumping out of the water as they are caught. A multi-million dollar sports fishing industry has evolved. Most modern sport fishermen release marlin after unhooking. However, the old fisherman in Ernest Hemingway's novella, The Old Man and the Sea, was storied to have caught an 18-foot marlin in order to sell its meat at market. The Istiophoridae family, to which the marlins, sailfishes, and spearfishes belong, are a family of bony fish in the Perciformes order. Nelson (2006) places this family in the Scombroidei suborder, but Collette et al. (2006) places this family into the Xiphiodei suborder together with the similar swordfishes comprising family Xiphiidae. Members of the Istiophoridae family are characterized by a bill that is rounded; a lateral line retained throughout life; elongate pelvic fins; scales present in the adult; jaws with teeth in the adult; a dorsal fin with a very long base that is sometimes sail-like and is depressible into a groove; 24 vertebrae; and a caudal peduncle in the adult with two keels on each side (Nelson 2006). The members of this family also share many characteristics with the swordfishes, including an elongate premaxillary bill (rostrum) in adults; dorsal fin origin over back of head; pectorals low on body; first dorsal fin lacking true spines, among other traits (see billfish). Traditional classifications, such as Nelson (2006, 1994), recognize three genera in Istiophoridae: Istiophorus (sailfishes), Tetrapturus (spearfishes), and Makaira (marlins) (Nelson 2006; Agbayani 2008). These taxonomies also recognize the blue and black marlins to comprise the genus Makaira and the white and striped marlins as being part of the spearfish genus of Tetrapturus. However, Collette et al. (2006), utilizing genetic and morphological data, recommend that Istiophoridae be divided into five genera, and this recommendation is followed by the Integrated Taxonomic Information System (ITIS 2008), which recognizes the following five genera: Istiompax (black marlin), Istiophorus (sailfish), Kajikia (white and striped marlins), Makaira (blue marlin, marlins), and Tetrapturus (spearfishes). Blue and black marlins. The traditional genus Makaira, called the "marlins" by Nelson (2006; 1994), is characterized by species where the forward portion of the first dorsal fin is not as high as the body is deep. Commonly, this genus includes three species, the black marlin (M. indica), the Indo-Pacific blue marlin (M. mazara), and the Atlantic blue marlin (M. nigricans). Nelson (2006) follows Nakamura (1983) in recognizing two species of blue marlin, based on the pattern of the lateral line, with the lateral line of the Atlantic blue marlin having a reticulate pattern, and the lateral line of the Indo-Pacific blue marlin having only simple loops. However, Collette et al. (2006) finds no molecular evidence to differentiate two species of blue marlin. Thus, some recent taxonomies only recognize one species of the blue marlin, Makaira nigricans (ITIS 2008; Collette et al. 2006). Furthermore, these taxonomies place the black marlin in a separate genus, Istiomplax as I. indica. Striped and white marlins. In the traditional classification of Nelson (1994; 2006), the striped and white marlins are part of the genus Tetrapturus, along with four species of spearfishes. The Atlantic white marlin is T. albidus and the Indo-Pacific striped marlin is T. audax. This genus is characterized by fish where the forward portion of the first dorsal fin is about as high as the body is deep (Nelson 2006). However, Collette et al. (2006) places these two species in their own genus, Kajikia, a practice followed by ITIS (2008). The marlin's common name is thought to derive from its notional resemblance to a sailor's marlinspike (Harper 2001). Marlin are known to be incredibly fast swimmers, reaching speeds of about 110 kilometres per hour (68 mph) (Johnson and Gill 1998; TA). 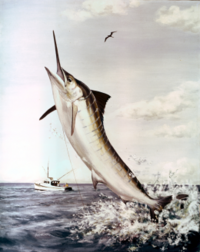 The black marlin has been reliably recorded in excess of 5 meters (16 feet) in length and 670 kilograms (1,500 pounds) in weight. As noted above, the classification of the marlins is unsettled both in terms of genera and species. Agbayani, E. 2004. Istiophoridae. In R. Rroese and D. Pauly, FishBase. Retrieved December 27, 2008. Harper, D. 2001. Marlin. Online Etymological Dictionary. Retrieved December 28, 2008. Integrated Taxonomic Information System (ITIS). 2008. Istiophoridae ITIS Taxonomic Serial No. : 172486. Retrieved December 27, 2008. Johnson, G. D., and A. C. Gill. 1998. Marlin. Pages 190-191 in J. R. Paxton, and W. N. Eschmeyer, Encyclopedia of Fishes. San Diego, CA: Academic Press. ISBN 0125476655. Nakamura, I. 1983. Systematics of the billfishes (Xiphiidae and Istiophoridae). Publ. Seto Mar Biol Lab 28: 255-396. Nelson, J. S., E. J. Crossman, H. Espinosa-Perez, L. T. Findley, C. R. Gilbert, R. N. Lea, and J. D. Williams. 2004. Common and Scientific Names of Fishes from the United States, Canada, and Mexico, 6th edition. Bethesda, MA: American Fisheries Society Special Publication 29. Travel Almanac (TA). n.d. Top 10 List: The fastest fish in the World. Travel Almanac. Retrieved December 28, 2008. This page was last modified on 15 August 2018, at 16:06.